I took a three hour nap this morning after Vigils, Lauds, Mass and Breakfast. You might say in part it is me getting used to the different schedule and nine hour time difference between Los Angeles and Germany. Partly this is true…but also this is a time when there is enough leisure time to just stop and say, ‘I am tired, I need a nap.’ We all need “down time”. Time to adjust to our surroundings, time to reflect on the rapid changes going around us each and every day, time to look at the big picture, not just the small picture of our every day frustrations. We know life is filled with meaning, but part of filling that life with meaning is taking the time to look, observe, feel, smell, and taste that meaning with all of our senses. Last night a German Family who I have known a few years after meeting on Facebook came to visit me at the Monastery. There was no agenda, no finality, no real purpose except to share a meal together in the monastery Biergarten and catch up on a year of absence except chats through the internet. Being in each others physical presence, and sharing this space of relaxation and conversation is part of living a leisurely existence. Our vacation as a matter of fact and my retreat is planned around intense times of solitude and prayer interspersed with time to visit with friends new and old and reconnect with the beauty of the German Countryside and Cities amd towns, small and large. I am always impressed how Europeans faithfully take 30 days out of their year for Holiday, Rest, Leisure, and Sabbath. This is my third year in my entire lifetime that I have adopted that custom. It has changed my entire perspective on life. The month I spend on retreat and holiday, and the time for reflection and quiet, is the model for how I want to spend every waking day, week, month and year. I met an Episcopal Priest once who belonged to the Paraclete Fathers, a contemplative order that works for the spiritual wellbeing of priests and religious. He said that their rule of life was one hour a day, three hours a week, one day a month and One week a year of retreat, contemplation, quiet, and prayer. This was the minimum time exacted of those who belonged to this religious community. Since I met him, this seemed to me a goal that every person whether religious or not could practically accomplish in a life time. As a professed Benedictine, my day, week, months, and years are pretty much divided in this kind of scheme. I pray 3-4 times a day. I take a good chunk out of my week for reading and rest (at least one full day), I get away once a month to a Monastery or Retreat center for a quiet day, and I spend these 15 days spaced of annual retreat time, like I am doing this month at the Monastery. Contemplation is a word that scared me for a very long time. I thought that it meant long periods of silence and emptiness sitting in front of a candle, observing my navel. I have never been that disciplined or orderly. But I have learned that contemplation is really about taking time each and every day to feel, think, remember, and connect with all of my surroundings, wherever that might be. Contemplation is what allows me to preach a reflective sermon each and every Sunday that is not about knowledge or information, or pious platitudes, but about how we all try and live our lives with meaning and balance. In that way, I am finally learning to be a contemplative, now as a mature adult. It is a work in progress. Contemplation, could be a big help for all of us during this Campaign year. Our society is fixed on living with extreme points of view, on demonizing persons and ideas, on making a crisis about each and every issue. We tend to ‘fixate’ on certain things and then just ‘Let go of them’ when we are emotionally exhausted. Even the national tragedies around gun violence only fill our emotional space for a brief time until the next tragedy. That is how we fight our wars, that is how we deal with our families during tensions, that is how we deal with workplace conflicts. We ‘obsess’ over things, issues and people, and then just forget…..until another crisis appears on the horizon, this is the opposite of real leisure and contemplation. It all goes back to balance. The daily afternoon coffee break or tea break with a cookie or cake to accompany it. The early morning cup of tea that so many of a generation in England were brought up with, that hour before you really wake up or get out of bed. The reading of the daily newspaper (almost obsolete). The leisurely walk around the neighborhood or park observing nature, peoples pets, children playing and others doing exercise. We need not wait until we retire and are utterly exhausted or perhaps too sick to really enjoy each and every day as it comes to us. Silence, Beauty, Relaxation, Breathing…. These are all key components to finding sacred leisure and holy contemplation in our lives. It is creating empty space..both internal and external so that we too may be filled with wonder, awe, and the Divine Presence. One day, one week, one month, and one year should never pass….. without a constant doses of this sacred elixir of life. 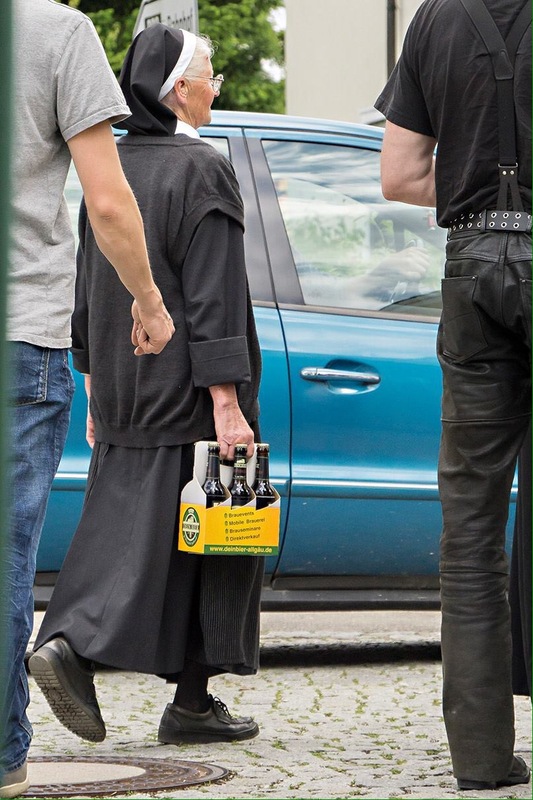 PIC: one of the Sisters at the Monastery Feast of St. Benedict (Benediktusfest) last weekend. Over 1500 people came to the Monastery last weekend to honor St Benedict in an outdoor mass, followed by food, games, drinks, and time for Holy Leisure. It ended in Solemn Vespers.